Your Work/Career LifeMap–What’s Your Next Step ? What does your history of work and career-related experience reveal about you in terms of your basic interests, passions, values, and your goals or aspirations? Can you trace patterns of development in how you have arrived at your current occupational and avocational situation? Where do you hope to be headed from here, and how will you get there? This process has helped me recognize a progression that, in my case, is leading toward a definite shift to a new stage and a major new direction. 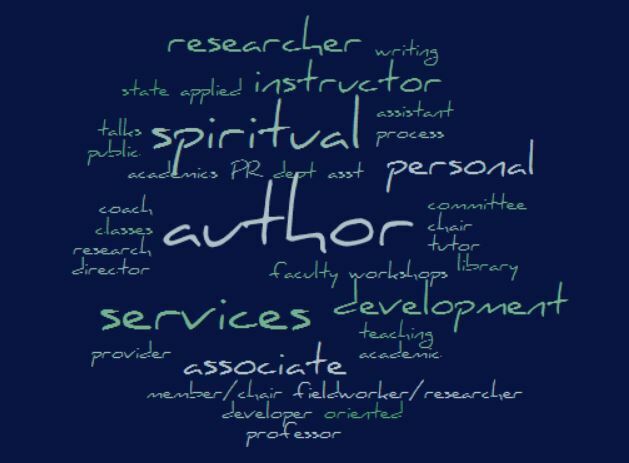 If I were being a bit more techy here—maybe you can do this with your word-cloud software—I would color-code specific kinds of words to track their development over time; for me, anything related to writing I would code BLUE, for instance, to trace the emergence and gradual transformation of that specific interest and activity. The shift my work/career lifemap reveals to me is that where writing has always been an avocation and later a professional tool, it has increasingly become a primary career focus, so much so that this mapping has given me a definite confirmation and support for an intention I have been nurturing but have been reluctant to act on for the sake of financial stability. My career mapping reinforces for me that my next step (in 2.5-3 yrs) is ‘retirement’ from my academic position in order to engage full-time with writing and related public service aspirations. Does your life-mapping of work and career-related activity reveal a pattern of growth and development in your life? Based on your mapping, what would be a natural next step, for you? How can you move yourself into a position to pursue that aspiration fully? The main goal of a life mapping process is to empower you to Live Your Dream, Now! Reviewing where you have been in relation to where you are now can help provide a strong motivation to focus your attention on where it is you are going from here, and how you can get Here!